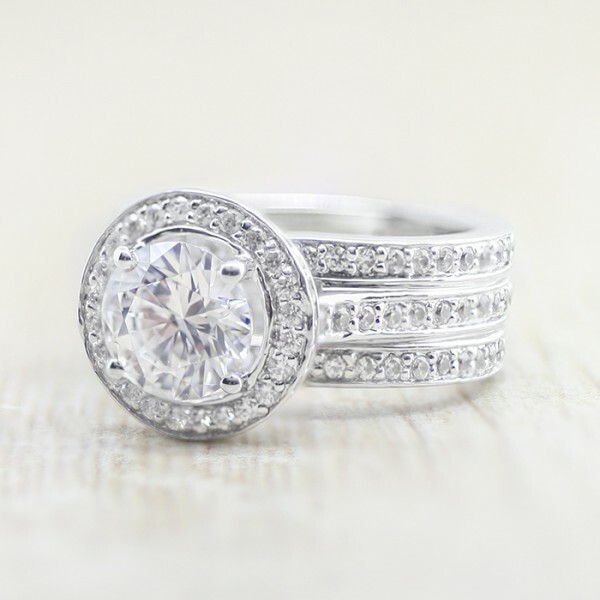 Kristen with 2.04 carat Round Brilliant Center - 14k White Gold - Ring Size 6.5 was added to your cart. The wide, segmented Bridge Band of the Kristen engagement ring has the look of three rings in one, with the middle ring's Round Brilliant cut Contemporary Nexus Diamond centerpiece lofted high above the others. The square bottom of the Euro style design is a hot new trend in rings, enhancing wearer comfort and also preventing the engagement ring from falling to the side or twisting around the finger. Center stone: 2.04 carat Round Brilliant cut Nexus Diamond, 3.59 total carat weight.